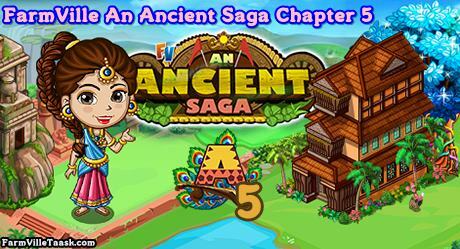 Let us help our friend convince Sage Drona in FarmVille The Solution, An Ancient Saga Chapter 5 Quests. We need to convince her to allow Meera and Arya to with us because the kingdom needs their help. We are going to help them in this mission. On this chapter of the An Ancient Saga Quests, we are going to craft 6 recipes at the ANTIQUE CENTRE. Prepare ahead the bushels that will be used so that it will be easier to prepare the recipes. Note: Expected to be released on Monday (April 1st). Info: Crafted at the ANTIQUES CENTRE and will need Balsam Pear Bushel x6, Caterpillar Banana Bushel x6 and Beach Cherry Bushel x9. Info: Crafted at the ANTIQUES CENTRE and will need Pini Jambu Bushel x6, Beach Cherry Bushel x9 and Balsam Pear Bushel x6. Info: Crafted at the ANTIQUES CENTRE and will need Hearty Custard Apple Bushel x6, Nagalinga Flower Bushel x6 and Pink Whampee Bushel x6. Info: Crafted at the ANTIQUES CENTRE and will need Red Bayberry Bushel x6, Cotton Burst Bloom Bushel x6 and Peanut Butter Fruit Bushel x4. Info: Crafted at the ANTIQUES CENTRE and will need Cotton Burst Bloom Bushel x9, Twilight Mulberry Bushel x9 and Pink Gooseberry Bushel x9. Info: Crafted at the ANTIQUES CENTRE and will need Ginkgo Fruit Bushel x6, Sunkissed Mango Bushel x6 and Salmon Berry Bushel x6.